I was given this product to try as part of the WeeSpring Parent Panel. I absolutely love this Graco Modes Bassinet 3-in-1 travel system!! First, it was super easy to put together. I barely needed to use the manual to assemble it. I refered back to the manual just to make sure that I did it correctly. The instructions were very clear to understand. The travel system came with the stroller, car seat and the car seat base. 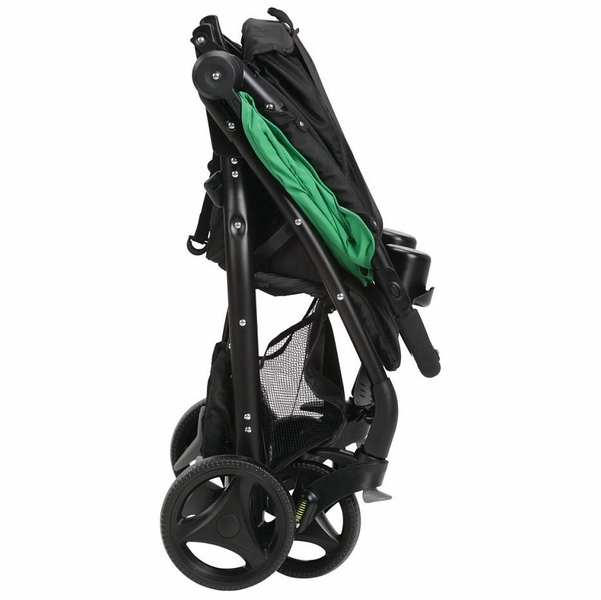 The stroller is super lightweight and very easy to push because it glides very nicely. It's also simple and quick to fold up for storage and easy to open back up. I also love how easy it is to unhook the car seat off from both the base and the stroller. I always struggled a little bit when it came to unhooking other car seats from the base. This base can be used with the latch feature, which is how I used it. It feels very secure. The car seat is very nice. I love the gray and black color and like that it was lightly cushion and comfy on the inside. The canopy for the car seat is big and I love it. 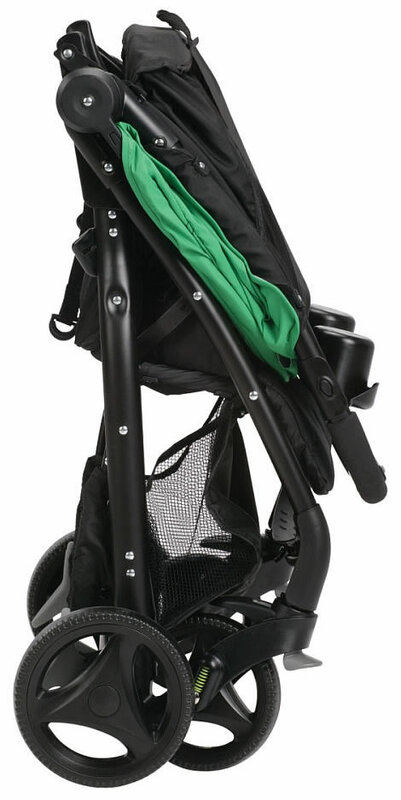 The stroller also has a very big and adjustable canopy/sun shade. It's great when I go for walks with the baby on super sunny days. My absolute favorite features of this stroller is that I can completely remove the stroller seat and just use it with the car seat hooked onto the stroller base, if I wanted to. I also love that the stroller can be positioned either facing forward or rear and that back of the stroller seat can be pushed down to convert into a bassinet. The bassinet feature is so great when the baby falls asleep. My son took a 2 hour nap in the stroller when we went to the mall and I truly believe it was because he was so comfortable in the stroller when it was in the bassinet position. I highly recommend this stroller and I couldn't see myself using another type of stroller. This is truly the best travel system in my opinion. Thank you WeeSpring Parent Panel for providing me with this product. From the first time my mom &' I saw this travel system we decided this is the one we wanted . Easy to set up , easy to handle , very lightweight, loving the colour . Shipping was really fast &' it looks exactly like the picture . Thank you so much and we are looking forward for making future purchases. This stroller was so easy to assemble and not as difficult to navigate compared to other strollers I've had. 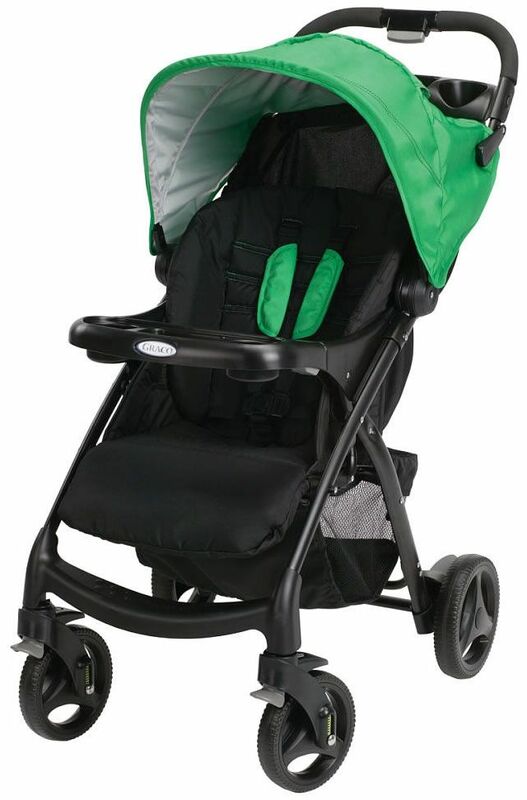 I love the canopy style of the stroller sun visor meeting the car seat sun visor. My little man loves it and so does mommy and daddy! 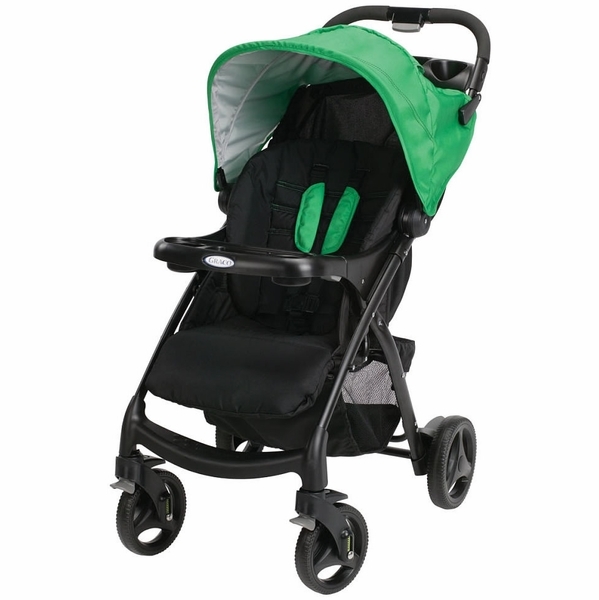 We love this stroller it rides so smooth and is very easy to assemble. The car seat clicks in place very easy and disconnects just as easy. The stroller is light weight and opens and collapses very easily and stores nicely in the truck of the car. The stroller looks nice and the extras are very handy and nice too. This is our first baby and we would totally recommend this stroller. Very nice features. Well rounded product. Only negative is that the left-rear wheel started squeaking during it's first use. I'm going to have to get some oil for the joint. Otherwise, outstanding. 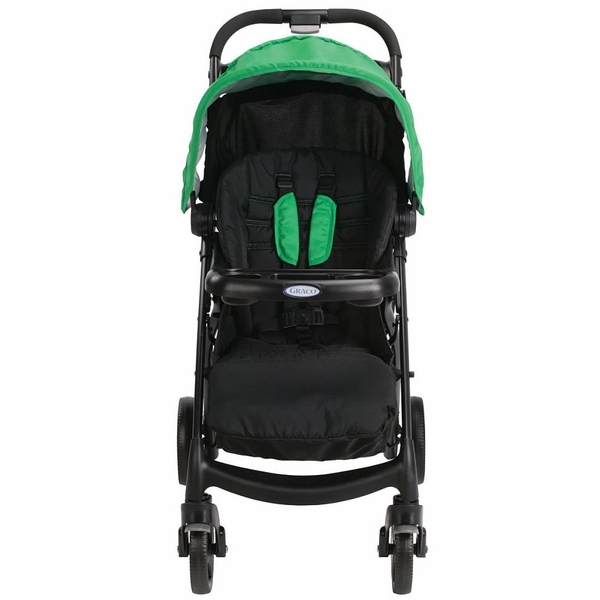 We absolutely love our modes travel system. So much so we used upgraded to the double! I recommend Graco to all new parents. The best!! Overall it's a good stroller for the price, but mine has developed a terrible squeak. Great Stroller.. you'll love it! I bought this stroller before the birth of my son. I studied amd compared it with others for days before finally deciding on this one. This system was perfect. I love that it was easy to assemble, strides perfectly on any terrain or surface and my baby loves riding in it. I specifically wanted a stroller with a large canopy and that's part of why I chose this system. It does everything you can think of,toward and back facing, carseat only, bassinet..it also has a high weigh limit which I great because my 13 month old is already 33lbs..he still fits comfortably in the stroller. We use it for everything and I'm so glad we purchased this system. Loved it but it didn't last. We received this while travel system as a gift and were really excited, but the stroller needs work. The latch that keeps it from unfolding has never worked properly, I think it was bent from the beginning and I just didn't know any better. It's always been a hassle to fold and unfold bc of this little latch. My son just turned a year old last week and we used this stroller to travel on an airplane, and now the latch is completely gone. so basically, it didn't even last for his while first year. Something this expensive should be way better quality and last through multiple children. Granted we didn't pay for it, but I don't feel like we even used it more than a handful of times, and for one trip, and now it's just junk taking up space. Very disappointing. Went together easily and is handy to operate. This is an updated version one we purchased for my granddaughter 4+ years ago! It is a very good stroller and my car seat that I bought separately clicks and fits perfectly. I was worried it wouldn't be compatible. I love the features and all the different modes it has. Can't wait to use it. Would have give a five, but had to order hardware that was missing from package. Hard to locate actual phone number from website. But after 45 minutes, waiting on line for someone to answer, I got the help needed to order. After that, received package within three days and set up units! Beautiful, reliable, and easy to put together! Looks promising and comfortable for both baby and parents. The stroller wheels clunk when using. Wouldn't suggest buying this! I bought this Stiller a month ago and really happy with my purchase. I bought this stroller for our youngest and SO wish I had it with my older children! Worth every penny! It is so easy to use and I LOVE that there are so many options for use! Right now my daughter is still in a carrier (Graco also) and it fits perfectly in this stroller. I have also used it in the "bassinet" position and love that she was able to sleep while we shopped (even during our Black Friday shopping trip!). I am excited to use it in the rear facing position when she gets bigger. WHY has no one done this before?! I can't tell you how many times with my older children that I would have to stop and go to the front of the stroller so they could see me...now I can just turn the seat around and she can see me all the time! Genius, Graco!!!! I received this as a baby shower gift and it's easily a daily necessity. It's so convenient that it is your car seat and stroller system all in one and even transforms into a toddler stroller later on. Perfect gift for first time parents! I can easily take my baby out of the car seat and into the stroller easy. It's light weight and easy to fold and unfold. I would definitely gift this! I bought this four months ago and I'm so happy I did. My baby loves the stroller. Love how quickly the stroller folds and how lightweight it is. It's great for on the go and getting it in and out of my car. I do wish the stroller back could sit up a little straighter. My child grabs the little tray and pulls forward for a better view. Otherwise, no complaints. I bought this for my daughter and we love it. It is really easy to fold up and works with the click connect stroller. The best stroller we could find! I did a lot of research before I purchased Graco Modes Click Connect Stroller. We needed a travel system with the bassinet, and unfortunately there is not a variety of manufacturers who offer bassinet feature. I love the idea of it being convertible from infant carrier to a toddler seat, instead of a separate bassinet as well. The stroller is easy to put together, to fold and unfold and to maneuver. I like the padding that is included for infants. Comes with parent's and child's tray with cup holders, has a huge storage basket which easily fits a diaper bag, a blanket and probably would fit something else! It is a light weight great quality stroller that gives color options to choose from (We got a grey one) and absolutely perfect for daily use! I have used my stroller about 8 times then I notice this squeaky sound coming from the wheels it's so annoying how do I fix it. We just love our new stroller and car seat travel system! It was very easy to put together and the car seat attaches to the stroller very easily! We can't wait until our new baby arrives so we can use it! Stroller is very convenient for shopping and walks. Easy to collapse and doesn't take up too much space in the trunk. Took off one star because the latch that holds the stroller together when folded rarely clicks by itself, and we end up placing. Great product. I love how versatile the stroller is...so many different ways you can use it. Pretty light weight for all of the functionality you get. The click connect system is the way to go, especially is you have multiple vehicles. I do wish that the carseat insert fit around the baby a little better, but I don't have any major complaints about it. Nice gender neutral colors. 1. the bottom adjustable foot piece is supposed to lock in 3 positions - Down when the kid is sitting, Mid when he/she is lying or you just want their feet up, Up if you want to form a bassinet and completely enclose the sitting area. The last one was the whole reason we chose this model. I was very disappointed to get our stroller with the third position malfunctioning, i.e. not locking in this position. There are velcro strips which serve us as a workaround, but I'm bummed to have a faulty piece. 2. wheels are squeaky just a few days after the purchase. Other than this, the stroller works fine. I buy this travel system for my baby that is born now in December. 10 years ago with my first daughter I used Graco and I love it, on this occasion it was not different. I love the stroller, all the features and the color is beautiful. This stroller maneuvers well and is very easy to fold up. I am very pleased with its stability and room underneath for storage. Can this stroller be used without a car seat? Hi, I'm wanting to buy this stroller as it looks great and easy to use. I'm looking to use this stroller for my newborn and up into toddler age but without a car seat. Is that possible with this stroller? I saw that it reclines so hoping it reclines enough to use for a newborn. stroller looks good and sturdy. It has enough storage and easy to handle. Assembly instructions were easy. Overall happy with the product. This item is great and also has a lot of excellent features. We got this as a baby shower gift for my daughter and we love it! Not only can you use it in multiple ways the toddler seat can be used as a bassinet so baby can sleep wherever you go. It may be a little bigger than most strollers but I love the huge basket That can carry whatever we take on trips out. I'm confident she'll be using this for many years. I love this stroller and car seat! When I was looking to choose a stroller I wanted something I could use more than a couple times. I wanTed to be able to use it as my baby grew. When I came across Modes Travel System i knew it's what I wanted. My husband and I love it. It's super easy to fold up and take with us anywhere. I bought this stroller in the summer of 2016. I didn't use it until my daughter was born in December. At first it was great. The car seat that comes with it is fairly light weight plus all the features on the stroller are easy to use. I was hoping to be able to use this stroller until my daughter does not need one anymore but that is not the case. The frame is very flimsy and wobbly after using it for almost 2 years. It also does not work very well on bumpy pavement. The stroller was great in the beginning but not practical as the child gets older. The car seat base was poor quality and I wouldn't depend on that base as a source of transportation for your little one. The car seat was fine, but the base is very unstable and untrustworthy. Definitely plan on buying a different base. Exactly what I was looking for and more!! Love worth every penny!! Highly recommend to any parent. We bought this stroller to use for our grandchildren when they are visiting. Immediately, the 21 month old fell in love with it when we put her in it for her nap. There is much more room for her than the stroller we were previously using. It is very easy to push and looks extremely comfortable when the child is sitting in it. This is one of the easiest strollers to fold up too. There are no complaints that we can find at all. This is a tremendous value for the quality and features. I highly recommend this stroller. It sounds like the stroller is about to break. It is so loud and the wheels get easily stuck. I wish the wheels did not make so much noise. Lightweight, easy to steer, and compact! I bought this stroller for my third child, I have previously used other various jogging strollers, however this is by far the best! Do not spend extra money on the more expensive brands, this stroller is the best! It is easy to steer, easy to close with one hand and light weight enough to use on hand to put into your trunk or van. Also other brands tires are bigger and take up your whole trunk. I do not have a negative thing to say about this stroller. Love it!!! Love it, the only thing was the box was wet and bad condiciÃÂ³n, but the stroller is great and beautiful for my baby girl. After using it 2 months: I I regret i bought it - it creaks, gets stuck and has no amortisation - i thought that it is obligatory.. my infant was moving and jumping on every little stone. I don't like it! We bought it for my preemie baby and it worked great! Are the wheels rubber or plastic? No it cannot be changed. The Graco® Verb™ Stroller gives you a stylish and smooth ride for your child. It features Click Connect technology to accept all top-rated SnugRide® Click Connect™ infant car seats with a secure, one-second attachment and an audible click for peace of mind. The lightweight stroller has suspension and a locking front-swivel wheel for an always-smooth ride and a multi-position reclining seat. There are plenty of convenience features to keep you and baby happy, including parent's and child's tray with cupholders and a large storage basket. You'll appreciate the one-hand, self-standing fold and the included carry strap.